There have been so many people who inspire us. These people are so great that they keep on inspiring us throughout our life. It’s not that they were born great. Their deeds and persona make them great. In their lifetime they do such things that make their people proud of them. 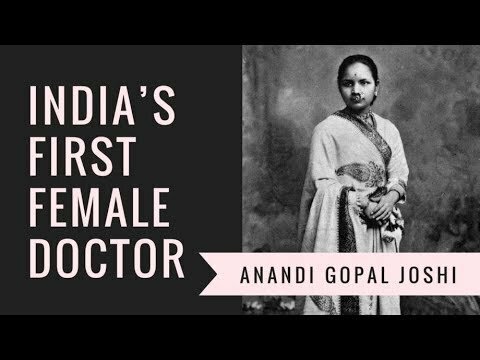 One such great personality is Anandi Gopal Joshi, the first woman doctor in India. Anandi Gopal Joshi’s full name was Anandibai Gopalrao Joshi. Born in Kalyan, Maharastra (then known as Bombay Presidency) her initial name was “Yamuna”. During several years of British rule, her family was of landlords. But excessive taxes by British officials made her family face a huge financial crisis. Due to this, Yamuna was married at the tender age of 9. Her husband was of 30 years and was a widower. After being married to Gopalrao Joshi, Yamuna was given a new name “Anandi” by her husband. At the age of fourteen, she became the mother for the first time. But due to lack of medical facilities, her child died after 10 days. Anandi was in grief after the demise of her child. She then thought she will become a doctor. She expressed her desire for studying, to her husband. Her husband gave consent. Then the man wrote a letter to American Missionary pleading to let his wife pursue medical. Also, he requested if he could get a job there so that he could accompany his wife during her study. In 1883, Gopalrao Joshi was transferred to Serampore, Bengal (now West Bengal). He influenced Anandi for going to the United States on her own. He inspired her to become an example for all other Indian women for pursuing higher education. He supported his wife during her study and kept encouraging her. Anandi Gopal Joshi was enrolled in Pennsylvania’s Women’s Medical College. By ship, she went to New York from Kolkata (then Calcutta). When she was of nineteen, she did her medical training. Due to cold, she suffered from tuberculosis and her health was deteriorating consistently, while she was still in America. But she never gave up and completed an MD in medicines. She earned immense publicity in India as well as Queen Victoria herself congratulated Anandi Joshi when she graduated. She was a foremost female of Indian origin who studied and graduated in medicine from the United States. It is because of Anandi Gopal Joshi women inspired to complete their education. Upon returning to India in 1886, she was welcomed grandly. She got the job of physician-in-charge of the Albert Edward Hospital. She died of TB, just a month before her 22nd anniversary she died on 26th February in 1887. When she died the entire nation mourned for her and in Poughkeepsie, New York her ashes were kept. This was a sign of tribute to her. Today, the Maharashtra Government gives a fellowship in the name of India’s first lady doctor, Anandi Joshi. She has set an example for women.